Why drinking dandelion tea can help you beat water retention, cut down on caffeine consumption and can serve as a herbal detox. Dandelion tea has a long history of human usage. Chinese medicinal practitioners used dandelion to treat digestive disorders, appendicitis, and breast problems (such as inflammation or lack of milk flow). The Iroquois Indians ate boiled dandelion leaves along with fatty meats to avoid indigestion. When the Ojibwas had heartburn, they drank dandelion root tea. The Kiowa women mixed dandelion blossoms with pennyroyal as a cure for cramps and PMS. The Mohegans drank dandelion leaf tea daily as a tonic to keep their energy levels high and to stay free of stomach aches and constipation. Other Indian tribes collected the young leaves in the spring and ate them with other leafy vegetables. And even now, it is not considered old-fashioned to use dandelion root, leaves or extract for common ailments. Now you may ask: Given its widespread herbal usage, what does modern science have to say about its health benefits? You can find the answer at Dandelion Health Benefits - Healing Herb or Folklore? If you are trying to give up coffee, dandelion root can be an excellent substitute in the morning. It can give you a “grounded” type of energy without the side effects of caffeine. Put one teaspoon of dandelion root in a cup of boiling water and add a touch of agave nectar to make your own beverage just as quickly as you make a cup of coffee. Dandelion coffee is usually made from dandelion roots that are slightly roasted and ground ready to use. The powder is said to be almost indistinguishable from real coffee, and is claimed to be better than lower quality coffee, which has often been adulterated. It may be used for a wide range of conditions requiring mild diuretic treatment, such as poor digestion, liver disorders, and high blood pressure. One advantage of dandelion is that dandelion is a source of potassium, a nutrient often lost through the use of other natural and synthetic diuretics. Fitness guru Gillian Michaels famously drank dandelion to help lose water weight fast. You can learn about her recipe in Dandelion Diuretic Benefits. According to Margaret Grieve, author of the excellent herbal encyclopedia A Modern Herbal, dandelion is "diuretic, tonic and slightly aperient. It is a general stimulant to the system, but especially to the urinary organs, and is chiefly used in kidney and liver disorders". 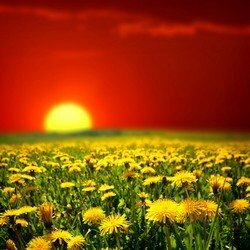 This page will summarize what she said about dandelion herbal remedy recipes. There are at least three different types of dandelion tea - those made from dandelion roots, those made from dandelion leaves, and those made from dandelion flowers. Dandelion flower is used mainly to make dandelion wine. Traditionally, it is known to be "an excellent tonic, extremely good for the blood". You can make dandelion flower tea by infusing the blossoms in hot water. You can make dandelion tea by infusing 1 to 2 teaspoonful of dried dandelion leaves in hot water. Drink up to 3 times daily. The cut leaf form of the herb can be brewed inside a stainless steel tea ball or inside a wicker tea cup basket. Compared to dandelion flowers and leaves, dandelion root is the part of the plant used most often for medicinal purposes, and which provides the most health benefits.